These cool new Concrete Salt and Pepper Grinders add a luxurious touch to the daily grind of dispensing salt and pepper. 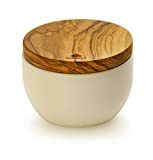 These sleek salt and pepper grinders have smooth white concrete bases topped with rustic Italian olive wood lids. They come in two different sizes to help you distinguish which grinder is which.